Today I am teaming up with the Gorgeous and super stylish Tara from Jimmy Choos and Tennis Shoes! Tara has been one of my favorite bloggers for a while! So I was so thrilled to do this collaboration with her! I love her style! I love how Tara mixes prints and colors and makes it look so effortless and put together! Be sure to check out her blog! I am sure you all will love it as much as I do! 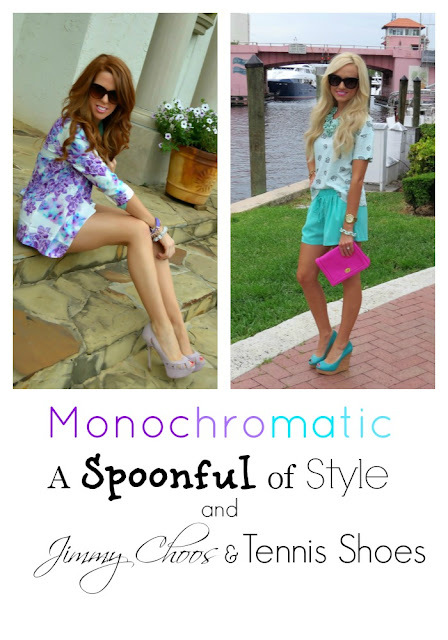 Today We our sharing 2 ways to wear the monochromatic trend! Monochromatic is one of my favorite trends! I went for a head to toe monochromatic with one of my favorite colors, MINT! But it doesn't have to be all or nothing! There are so many fun ways to do monochromatic! If you don't want to do head to toe just add monochromatic accessories or a top and shoes in the same color family or print! This is SO cute!! I love that shirt and those shorts look perfectly comfy for summer. love this Jade, these shorts are so cute. Lovely photos girl! I love your outfit!! the pop of pink with the blue is perfect!! Yay Jade! I'm happy to see your new F21 pieces... you make that seashell tee look so chic. Love this outfit! My favorite color...and I love it paired with the pink clutch!